Subscription-based, unlimited streaming of over one million songs in the classical genre and more. Listen to songs and albums on demand or create playlists. Explore artist and composer bios, view opera libretti, and more. 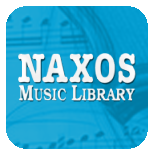 Access the Naxos Music Library from your computer or mobile device.